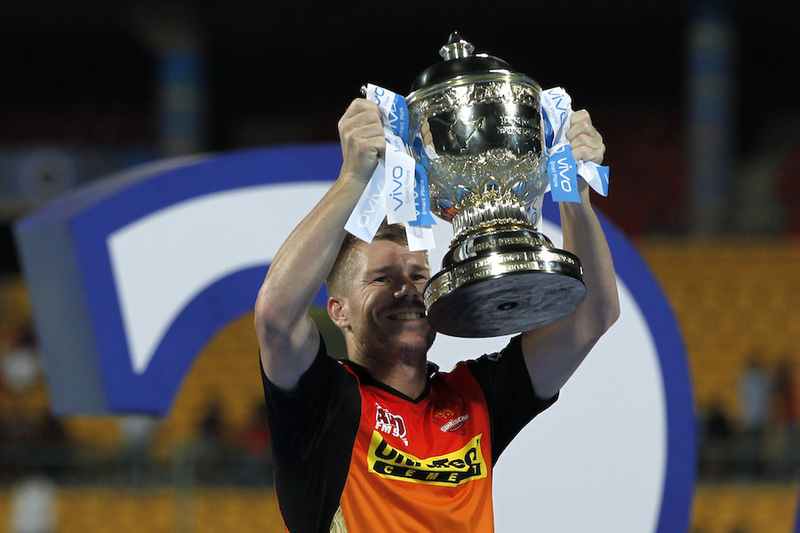 David Warner with the Vivo IPL 2016 trophy. Two of the most deserving teams had reached the final of the Vivo IPL 2016. Apart from being a final between two teams, this match was a final between two captains. Yes, to some extent it was a match between Virat Kohli and David Warner. Both captains. Both aggressive. Both leading their teams from the front, being the top run-scorers for their respective teams. It was arduous to pick a favorite before this match. You wanted Royal Challengers Bangalore to win for Virat Kohli, AB de Villiers and Chris Gayle. You wanted Sun Risers Hyderabad to win for David Warner. You wanted RCB to win for it's home support. You wanted SRH to win for it's bowling attack. Such was the beauty of the match! Sun Risers reinstated Mustafizur Rahman in place of Trent Boult against the unchanged Royal Challengers. Warner won the toss and chose to bat first, which was expected especially after considering their record of defending totals. A steady start was converted into a fiery one when Warner and Shikhar Dhawan smacked Shane Watson for 19 runs in his first over. By the end of the powerplay, Sun Risers had reached 59 for the loss of no wicket. Yuzvendra Chahal was introduced in the seventh over and he continued his golden run by dismissing Dhawan. To continue the golden run at the other end was Warner, runs from whose bat did not stop even after losing Dhawan. Henriques mistimed pull off Chris Jordan went straight into Chahal's hands. By the half way mark, Sun Risers' score reached 97-2. On the last ball of the 11th over, Yuvraj Singh drove Watson through the covers. The timing, the position and the sound of the bat could tell you that Yuvraj has come for a reason. Just when 200 was on the cards, Warner's slash off Sreenath Aravind went straight to Iqbal Abdulla at short third-man when he was on 69. The hotshot was gone. Yuvraj smacked a six and a four in the next over against Chahal. But Deepak Hooda, Yuvraj and Naman Ojha and Bipul Sharma's wicket is successive overs brought back RCB into the game. SRH was 184-7 by the end of the penultimate over. With Watson to bowl the last over, 200 was looking in the back of beyond. Although Ben Cutting had some other plans. The big-hitter in him came to the party when it mattered the most. He scored 24 runs off the ultimate over including an 117-metre six out of the Chinnaswamy Stadium. Cutting finished on 39*(15). Watson ended up with horror figures of 4-0-61-0. A target of 209 did not rule Royal Challengers out of the game, such was the might of their batting line-up. It was the universal boss, Chris Gayle, who started in top gear from the word go. Kohli was playing the second fiddle. 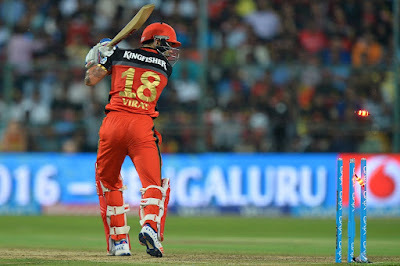 RCB, too, reached 59 by the end of the powerplay. Kohli had just contributed 10 runs off 12 balls in that. Henriques' first ball of his first over was given a hot bottom over long-on for a maximum. Gayle had reached his half century with this shot and looked close to unstoppable. The big shots kept on coming with Kohli joining the act as well. Bangalore reached 112-0 midway. The next over brought with it a ray of hope for Sun Risers. Gayle misjudged Cutting's off-cutter and the toe end off the bat went to Bipul Sharma who took a diving catch running in from third man. Just after completing his half century in the 13 over, Kohli chopped on a Barinder Sran delivery to his stumps. In the following over, AB de Villiers miscued a Bipul Sharma delivery to Henriques and his dismissal was perhaps the turning point in the match. With 51 required off the last five overs and Lokesh Rahul and Watson on strike, the target was never out of reach. It was just that one out of these two had to stay until the end. 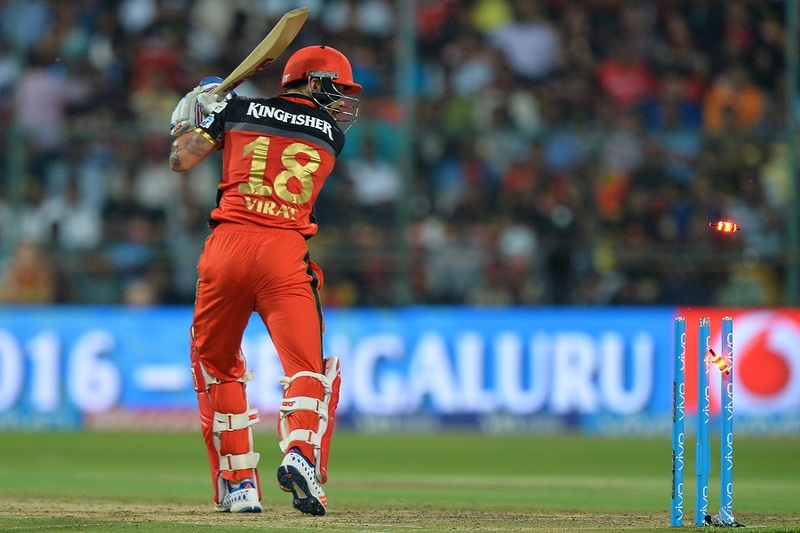 Their dismissals in successive overs further dented RCB's chances. Kohli's dismissal was the turning point in the match. In the last three overs, 37 were required with Sachin Baby and Stuart Binny on strike. The equation was brought down to 30 off 12, with Mustafizur Rahman and Bhuvneshwar Kumar to bowl the last two overs. Fizz conceded 12 in his last over which also saw Binny short of the crease on the first ball. 18 off six balls required some serious hitting from Baby. But that was a daunting task in front of Bhuvneshwar. RCB fell short of 8 runs in the end. The sun had risen for the Sun Risers. It might have been the city's second IPL title, but it was the franchise's first. The fact that not many people expected them to win adds more shine to their trophy. The victory was a perfect exemplary of a team playing and winning as a team. Their captain, David Warner led them from the front. He amassed 848 runs in 17 matches at an average of 60.57 and a strike rate of 151.42. Captaincy is not natural to him, yet he accepted the reigns from Darren Sammy last year. Their bowling attack deserved this triumph for being the best in the tournament. Credit also goes to Tom Moody, VVS Laxman and Muttiah Muralidharan, the trio was constantly seen motivating the players in all situations. The orange army was seen commemorating and singing their team song.